Coffee Tycoon is a snore of a put together by Jamopolis Interactive that has its players running for a cup of coffee to help them stay awake while playing it. This low drip game has players setting up a coffee shop in one of five locations with in the US. 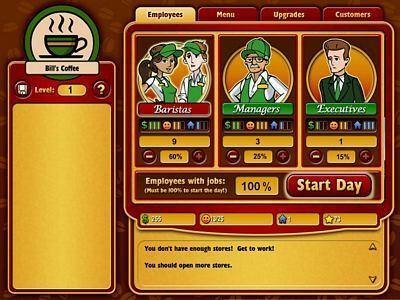 Players balance their resources between employees, management and executives to help perk your simulated coffee empire. As your caffeine-driven enterprise grows you earn money and increase the number of shops to help run your business. 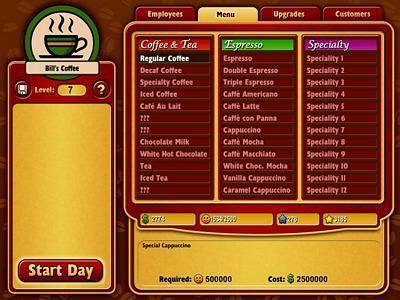 In Coffee Tycoon you navigate between four tap screens; Employees, Menu, Upgrades and Customers. The Employee tap allows you to adjust the percentage of hours you schedule for the executives, managers, and Baristas (clerks). The Menu allows you to up grade to different types of coffees available at your shops, the Upgrade allows you to select from employee benefits, shops, advertising, buildings and equipment. Unfortunately none of these options seem to make any difference in the performance of your shop. The fourth tap Customers, allows you to view the different types of customers that may visit your coffee shops and read a little blurb about them. Except for the picture it didn't seem to make a difference in the game. Coffee Tycoon offers no graphics for shops or toggling between shops except for the "Level UP! One would have a difficult time noticing that any thing was happening. The Screen shot below is a sample of the most exciting thing to bee seen in this game. YAWN! 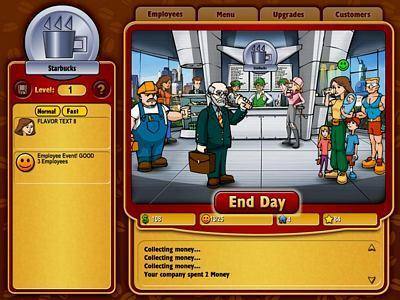 Coffee Tycoon is available at game shops or can be downloaded to your computer from their web sitewww.coffeetycoon.net. It is easy to figure out and control with a mouse. The graphics are quite dull consisting of a group of two dimensional figurers pounding back coffee and number counters to keep tabs on your store performance and income. Making adjustments to the employee vs. management ratio seems to have no effect on the game. Each turn you click on start day which then leads to a seemingly random display of messages or coffee facts. The only redeeming feature of the game was the interesting jazz music which seemed to give the game some juice. When installed the game will attempt to go online to so it is best to keep your firewall up to avoid any unwanted cream or sugar added to your computer. Over all I just suggest that you go to your local coffee store and watch the customers they are likely to be more entertaining than this game.